Last night we visited an old favorite. The Top Steakhouse is about as retro as you can get. And since retro is really "in" right now, it is “the place to be”! We took my niece and nephew (this would be the niece that just gave my sister a kidney!). We really wanted to treat them to a nice dinner out so they could relax and have fun. We also wanted to thank Tashia, just from the two of us. We love her so much and her generosity is amazing! When we walked into The Top it truly was like stepping back in time. About the first thing we saw was the piano player singing and playing dinner music for the guests. The host greeted us and had someone seat us almost immediately. We had a nice booth almost to the back of the restaurant. I loved that because I could watch what was going on and what was being served to the other diners. Our server, Andrea was there right away, greeting us and asking if we would like something to drink. I told her I wanted something girlie & fruity. She started running down a list of martinis. 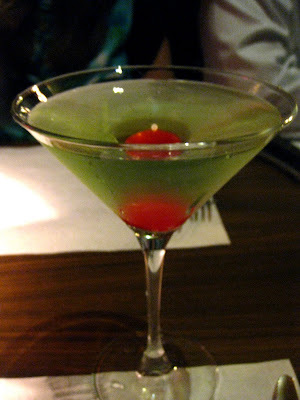 I’m not even going to blush when I tell you that I stopped her at the Appletini. I know it is cliché, but it just sounded darn good. And was it ever! And pretty, too. Maybe I’d better stock up on some of this stuff for St. Patrick’s Day coming up! That green drink would be spot on! But I digress. We were asked if we would be ordering from the Restaurant Week menu and were left with that and a list of suggested wines, which I thought was a great foresight. Of course all four of us had perused the menu at great length and knew just exactly what we wanted. I need to tell you that when we arrived at our table, it had already been set with service for four along with full water glasses. In addition, there was a plate in the middle of the table with a pre-arranged starter. 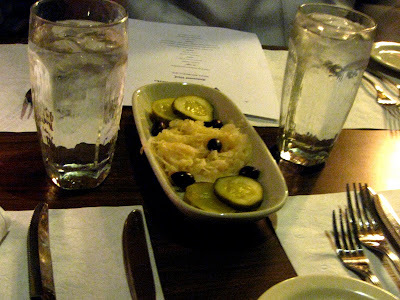 It included sauerkraut in the middle with four thick slices of dill pickle and pitted kalamata olives. I found it to be delightful. It whetted our appetites; not that we really needed any whetting as it was. But it prepared and cleansed our palates. The first course was soup. Our choices were Lobster Bisque or French Onion. Tashia and Bob decided on the Lobster Bisque, while Bryan and I chose the French Onion. I have heard that The Top is famous for their French Onion soup. And there is a good reason for that. The soup was absolutely, totally awesome. The broth was so rich and clear, full of onions that had been sautéed to coax out their sweetness. 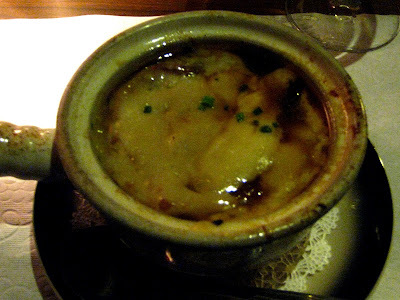 A thick layer of cheese had been melted over top of the crock of soup. This was the heaven of the soup world! A veritable crock of gold at the end of the rainbow (I seem to have a “Wearin’ ‘O the Green" day theme working here). 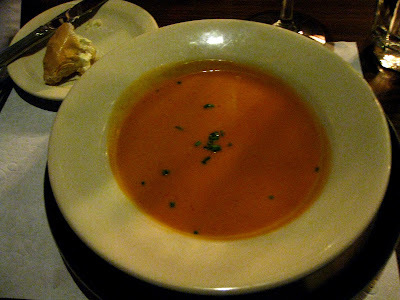 The Lobster Bisque was rich and decadent, with bits of lobster working their way through the sherry kissed base. Judging by the one spoonful that I coerced my husband out of (not really, he would have shared more with me if I’d asked…and traded French Onion soup)The Top also knew their way around a pot of Lobster Bisque. The second course was the salad course. 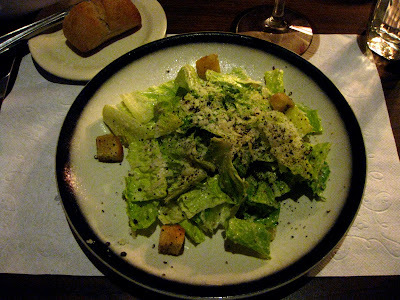 Choices were a Caesar Salad or the Top House Salad. I was the only one of the four that chose the Top House salad. 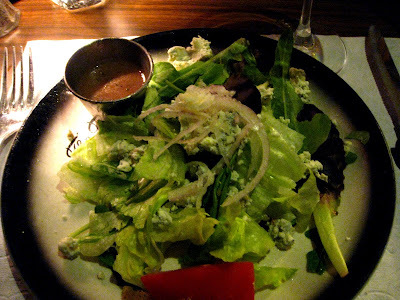 It was a good mix of greens that were fresh and had a nice crunch, a few slices of red onion, a wedge of tomato and crumbled blue cheese with an Italian vinaigrette: just delightful. Bob, Tashia and Bryan had the Caesar Salad. They commented that it had a “bite”. Bob and Bryan liked it quite well, but Tashia would have preferred it milder. Now for the main course. Oh man, had I been waiting for this! As in, all day waiting for this! 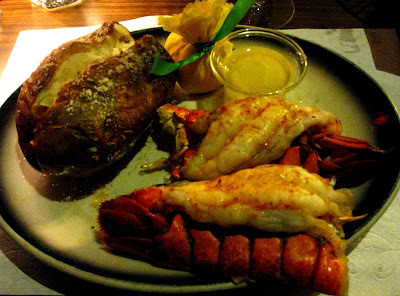 There was not a second’s hesitation for me to practically shout out that I would have the Lobster Tails. No question at all. I was having the “two 5 ounce lobster tails served with baked potato”. Tashia was right on my heals with her order. 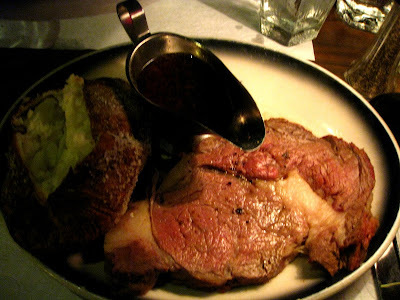 Bryan went with the Prime Rib; “10 ounce prime rib with au jus and baked potato”. Bob chose the Pecan Crusted Salmon; “with bourbon glaze and sautéed spinach.” I was quite happy with his choice. I thought that looked absolutely delicious, but not enough so that I wasn’t going to have the lobster tails. All right! With Bob ordering it I knew I could talk him out of a taste…or two. Dinner arrived. 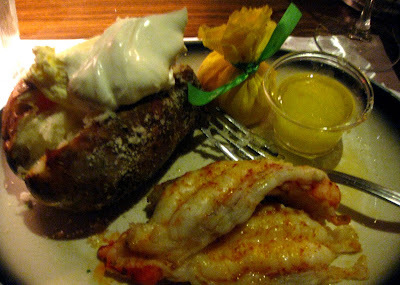 The lobster tails looked totally divine. The presentation was so pretty. Andrea swiftly removed the shells for us and loaded our baked potatoes with a most generous spoonful of butter and sour cream. 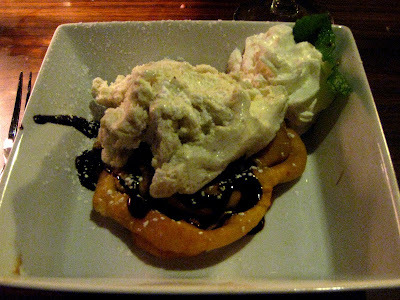 ..I’ll diet tomorrow…um, I’ll diet after Restaurant Week is over! I cut a piece of the lobster; I dunked that piece into the drawn butter; I slowly lifted it to my mouth…total and complete sensory overload. This lobster was so perfectly cooked that I swear it was a spiritual experience! My taste buds sang the Hallelujah Chorus along with the angels above. As I slowly opened my eyes fully expecting the entire establishment to be in awe of what was happening at our table, I looked around to see life as we know it going on. Even at my own table! Did they not know what had just transpired here? Well, evidently not. However, I think Tashia might have been having her own “moment” across the table from me. I didn’t ask. I just simply moaned a little I believe. Bob looked at me and smiled. Hmm, maybe he was sitting close enough to me that he heard the angels singing. The prime rib was pretty awesome, too. Bryan shared, and I am telling you it tasted just like prime rib should taste. It was so juicy and so tender and so cooked to perfection. Tashia said the gentleman at the booth behind her commented that he didn’t even need to use a knife on his, and that it was so tender it almost melted in his mouth. We concurred with him! That was some of the best prime rib I’ve had in a long time. Bob generously shared his dinner with me. He urged me to try the spinach and to put some on my plate. In fact, he urged me to put all of it on my plate. Bob has never been a big spinach eater. I on the other hand, could have a spinach eating contest with Popeye. (Now wouldn’t that be ugly? I’m so sorry I put that visual in your head.) I love spinach. And The Top knows how to sauté spinach. It was yummy. My husband is really generous. He also was happy to let me taste his salmon. It was so good I wanted to slap the table, if you know what I mean. The salmon was not overcooked which is a crime in my book. It was moist and had a crust that must have had some brown sugar and it was then covered in chopped pecans and cooked to perfect doneness. The bourbon glaze just made it sing when it hit your tongue! This was most definitely a dish worthy of being showcased on any Restaurant Week menu. I am sorry to say that the one picture taken of the salmon just didn't turn out. Even though we were completely stuffed, we still had the dessert course. And even though we were completely stuffed, we managed to eat it! Our choices were Crème Brûlée, NY Style Cheesecake and Triple Chocolate Cake. Here was our disappointment of the evening. Bryan was really looking forward to the crème brûlée. When he told Andrea this is what he wanted, she informed us they were out of it. Bryan was truly bummed. She offered the funnel cake with chocolate syrup and vanilla ice cream as a substitute. That is what Bryan and I ordered. Bob and Tashia went with the cheesecake. The funnel cake was good. The middle of mine was a bit hard and I’m not quite sure why. Like I said, it was good. But it wasn’t crème brûlée. Bob and Tashia both liked the cheesecake. 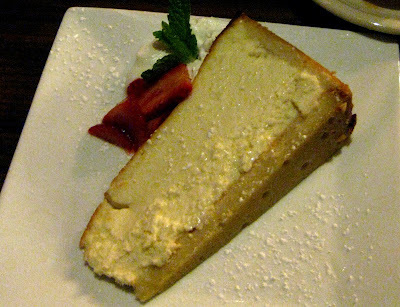 I tasted Bob’s and it was a good New York style cheesecake; smooth and a little bit tangy. What a great meal! We really enjoyed ourselves. And we certainly enjoyed the food. The atmosphere of The Top is fun; I bet on a weekend night it is just like the supper clubs back in the day. Why, I was expecting Frank Sinatra to walk in at any minute! I haven't been to The Top in ages! Glad to hear they are still doing everything well. I hope they still have the copper cappuccino machine in the bar. I always made a point of having a fancy coffee drink after dinner when we ate there. This may be where I do my birthday dinner!